Now I must give a well deserved "shout out" to my good friend Miss Kat Koeller of New Bremen. Aside from being my personal web consultant Kat has her own etsy shop, http://www.mysweetiepeas.etsy.com/. 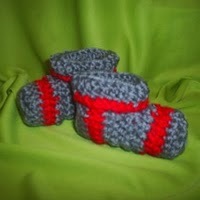 She crochets the cutest little shoes and does all sorts of things to yarn that I don't even want to understand. She's probably the only person I will ever know who wants to own her own spinning wheel and sheep. If you need a special gift for a little one (or even an adult) drop her a line. Kat@mysweetiepeas.com. Many thanks Kat for your hard work, patience, and your ability to drop everything for mexican food or a craft store. Check ya later!